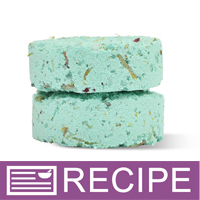 Pamper Mom with this handmade bath fizzy made with chamomile, rose, lemongrass and other calming ingredients. 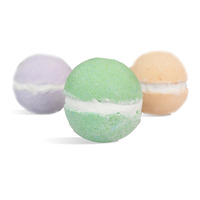 Many luxurious items are packed into these guest sized bath fizzies. 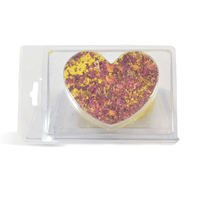 Chamomile, rose, lemongrass, passionflower, orange peel and lavender are embedded into these bath treats, and will disperse into bathwater when used. As the bath fizzy dissipates into the water, refreshing scents of Moroccan mint, garden cucumber, juicy clementine, cyclamen blossoms, lily and cactus will fill the room. Package a few of these in cello bag with curling ribbon and a handwritten note and you have yourself a thoughtful handmade Mother's Day gift! You Save $14.15 by purchasing this kit rather than buying the items separately. "HOW much fun was this! " COMMENTS: I was leery about this (well, all 'fizzie' recipes) but found this one so easy and fun to do. To help clarify with a previous review, the quantity is correct: you have to make 1 set of 6 and then another set of 6 to get the 12 the recipe claims. I found this first a bit inconveniencing, but then to my advantage. I don't use coloring in my products (other than what is in the FO or EO's) so I was not going to use the green, but said oh what the heck. I used it in the first batch, and then not in the next batch, so the set will have a few of each; a nice variation. I actually got 7 out of each batch. I did find that to get the disk out, it took a bit of patience, and wiggling of the back of the mold. I absolutely LOVE the fragrance; a nice pine but fresh scent, not an overwhelming PINE! I find the size to be ok, if someone wanted to use it as a shower fizzie, 1 would be fine. If someone wanted a bath fizzie, they would have the choice to use 1 or 2 to their liking. I had ordered another kit that had the same mold, so I had another ready for the extra disk. Caution: Not sure how best to store these until selling, but I did find that I had to put them in a zip baggie until I can find a better storage. The moist air seems to want to 'set them off'. We get about 116" rain/yr. I run a dehumidifier almost 24/7. COMMENTS: I was very excited about this product, and I LOVED the scent it came with. However it states that this kit makes 24 fizzies.......I got 6 out of my kit! If you fill the mold to the top you will end up with 6 full size fizzies and a tad bit extra, not enough to make a 7th fizzie. I followed the directions to a tee as always, but there is no way you get 24 UNLESS you skip the mold and roll them into very small balls. COMMENTS: My very first attempt at making anything from WSP. This recipe was sooo easy and the results are fantastic. Gave some away for birthday gifts and free "trials". Everyone is asking for more. I use these in my foot bath for amazing softness and results. It's the ultimate in a pampering treatment. Try it...you'll love it...so will your customers. Also, had some garden tea and fragrance oil left over to use in experiments with other products. COMMENTS: I love this kit! It is so easy to make and a lot of fun to use. 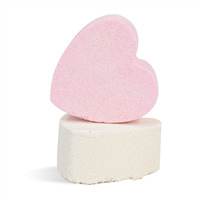 They fizz up really nicely and leave your skin smooth and silky. They were a little difficult to get out of the mold without cracking or crumbling around the edges, but I think once you use the mold a few times it will be easier to use. If you don't want the tea floating in your tub, either leave it out or put the fizzie inside a soap sock or tea bag/strainer. COMMENTS: I like the Moroccan Mint fragrance but thought the tabs would be a bit bigger. COMMENTS: I like the format of the kit- you order this ONE thing and you're all set! The printed recipe was even included. It was the first bath/body product I have made myself (along with my hubby) and it really was easy! I do think it would have been helpful though if the kit contained more than one mold set, so that you could make the 4 batches at the same time, instead of waiting an hour in between each while the fizzies dry in the mold. However if you already have additional mold sets you'd be fine. Or if you only wanted to make 6 at a time, then it'd be no big deal. I plan on ordering more molds. Anyway, I also found the fragrance to be a bit overwhelming but I think it was probably because I added too much. 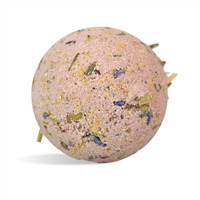 The bath tea looks really cool in the fizzie, and I do love tea in the tub but it will require some cleaning after you take a bath- which is not something to look forward to after taking a relaxing bath. I think I will make more fizzies trying a different fragrance and probably omitting the bath tea. I do recommend this kit though! It definitely enabled me to make fizzies (successfully!) and gave me ideas on how I would like to change things up a little. And it really does make a nice gift! WSP Response: Thank you for your review! We're happy to hear that you enjoyed this product. To help avoid the mess in the bath tub we may suggest placing the fizzie inside of a muslin bag or organza bag during use to catch the botanicals. "If selling as retail,how much for the four pack would you recommend?" "what would you charge retail per 4 pack?" Staff Answer I would recommend a retail price of $12.95 per set of 4.